Eva at the helm with Axel enjoying his HR43 while anchoring up side-by-side with our boat. I have knows this HR43 since she was new. And the owner is a good friend of mine, and not any of friends! Axel and Eva are two HR lovers and Axel has owned a HR36 before he bought this HR43 new from the yard in the same year as I got my HR40 Regina (2003). 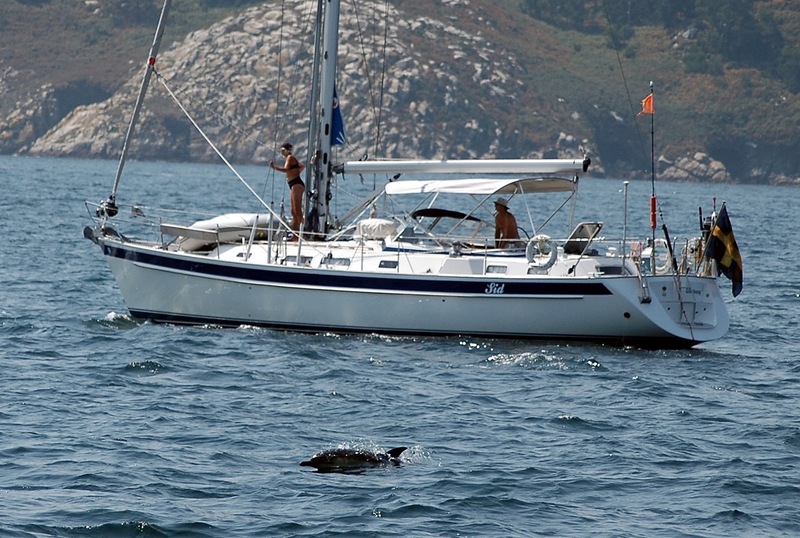 The longest voyage Sid has done is just into the Mediterranean, here photo taken in Galicia. 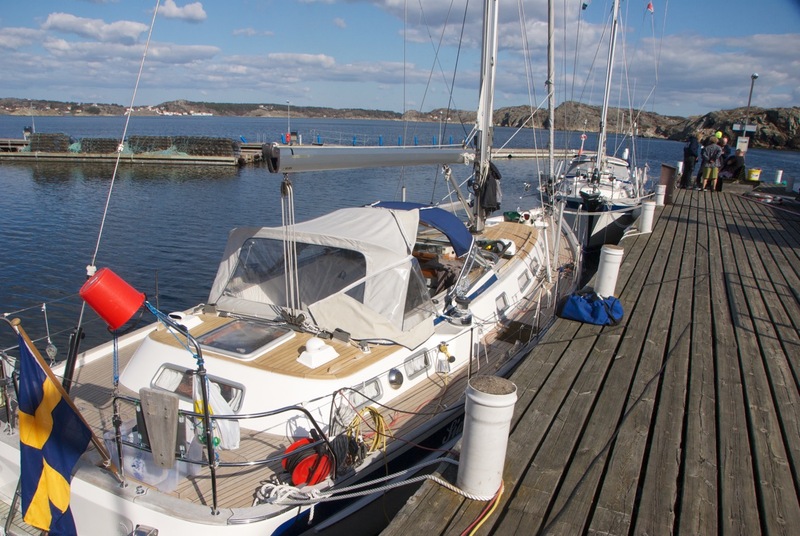 The following summer, she was sailed back to Sweden and has remained there during the rest of her life. You might argue that the boat is 15 years of age, and counted in numbers, you cannot deny it. But Axel is not any type of person, he’s a dentist and with it comes a sense of perfectionism. 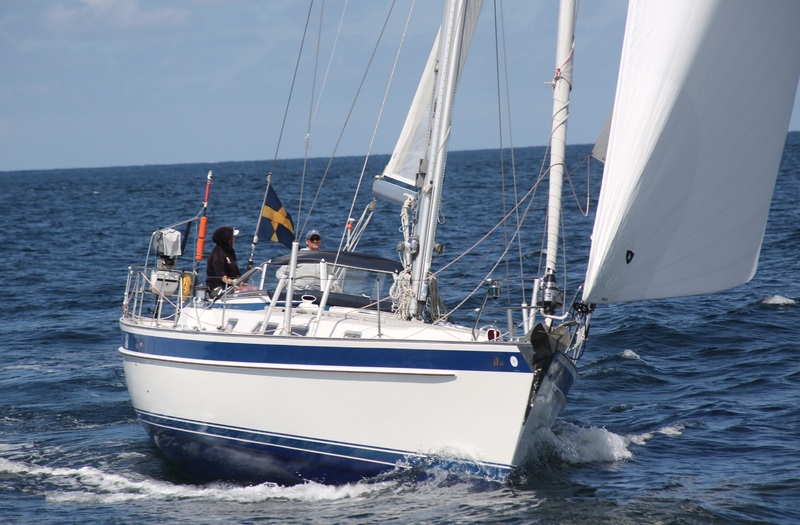 Axel and I have always had head-on (secret) competitions, who has the nicest looking Hallberg-Rassy! With the HR40 and HR43 both being born the same month, we both started from scratch with a brand new boat each. 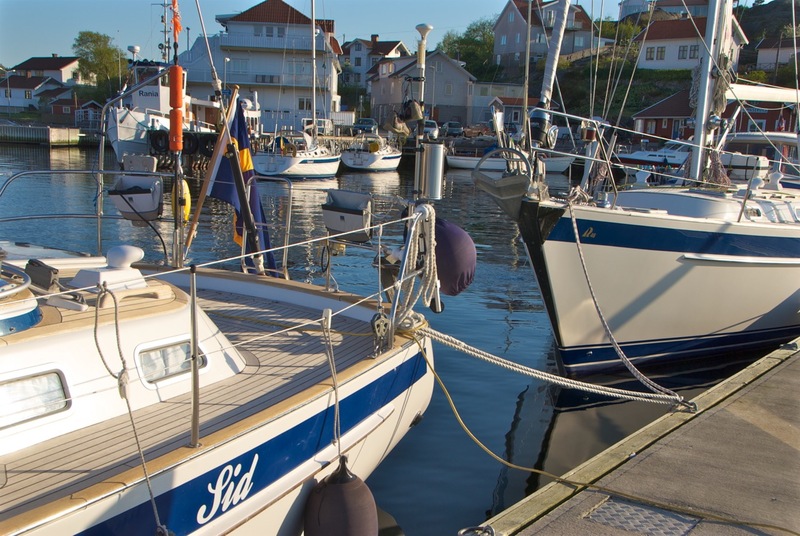 Ever since, it seems, Axel has spent more time keeping his boat boat Sid in mint condition than he has ever sailed her. 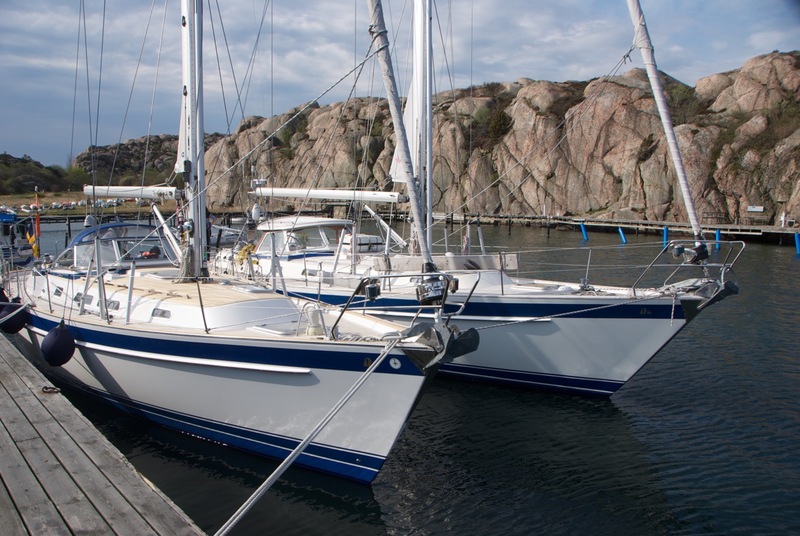 Axel and Eva just love their boat and have invested year by year. Needless to say: I always lost the game! 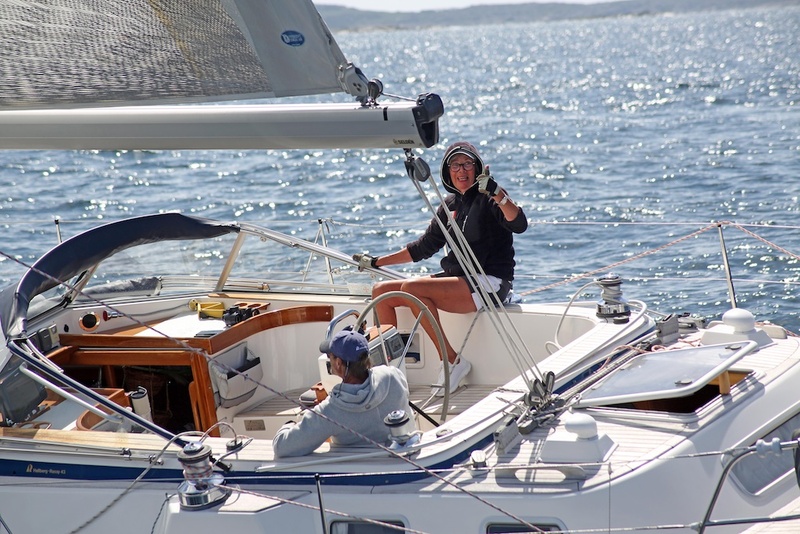 Yet another gathering between Sid and Regina Laska some sommers ago, here in Skärhamn in Sweden. Observe the maststeps in order to get up the mast to clean it! I totally gave up keeping up with Sid’s shine when I saw Axel one day hanging in the mast to clean his radar dome half up the mast from the upper side. Nobody except God and the birds ever saw the dust up there, but he wanted his boat to be clean and neat! Axel, as I know him best: Always keeping his HR43 Sid the best looked-after boat on the planet. Axel could never imagine to have anything not in mint condition! 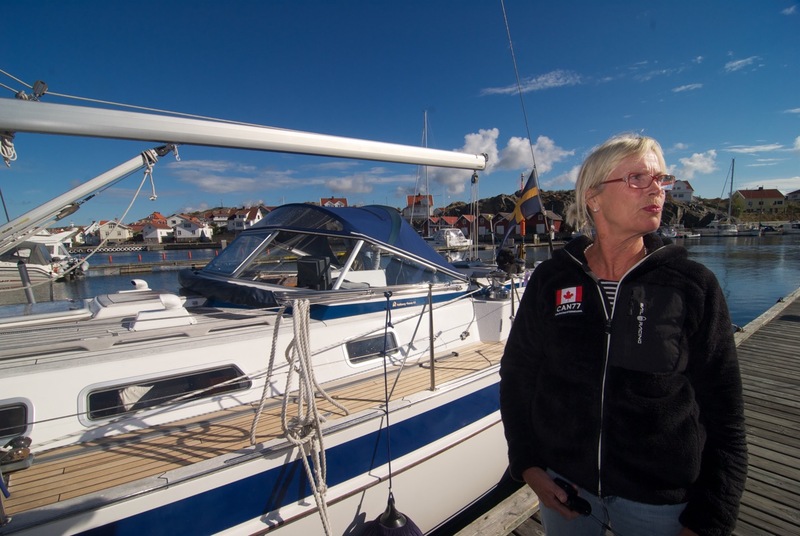 Axel and Eva equipped the boat for sailing around the world, but never did. The same year as we sailed our sabbatical, we had company down to Spain. While we crossed the Atlantic, they turned into the Med for a winter and then sailed back to Sweden again. Ever since, they have only sailed Sid up and down the Swedish coast. 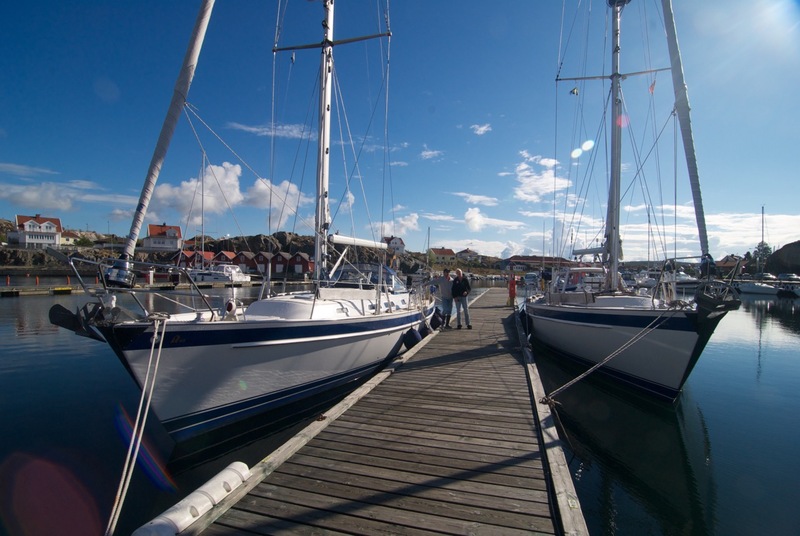 Sid (left) and Regina Laska (right) berthed next to each other at Lilla Kornön in Sweden not long ago. I have tried to discourage Axel and Eva from selling his beloved HR43 Sid, since I know he will regret it. 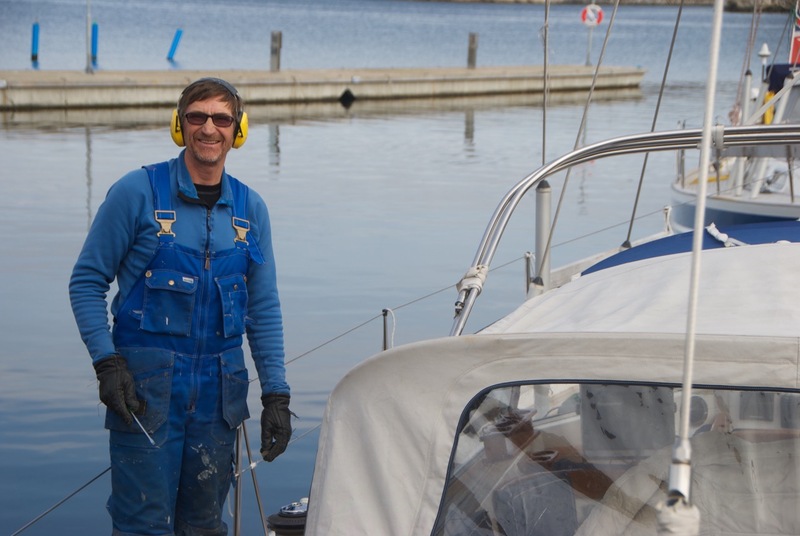 His belief is that he wants a small day-sailor instead, sailing in and out of his beautiful house situated in the Swedish archipelago. 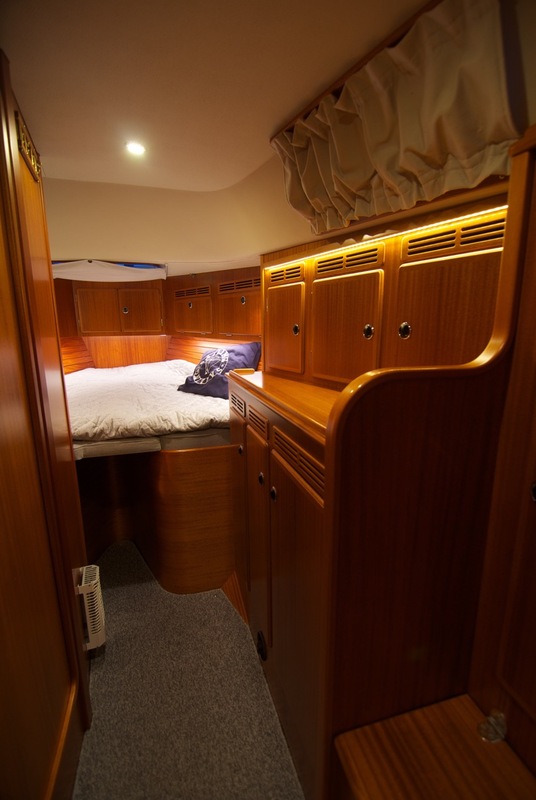 I can’t stop him from selling, however, and so I advertise this fine HR43 on my site in the hope that we will find a new owner who appreciates this boat as much has he (and I!) do. N.B. I can reveal that Axel actually had a customer wanted to buy Sid a couple of months ago and he gave him an offer being slightly under the asked SEK 2.999 Mio (approx EUR 288.000). Axel’s response: “If you can’t appreciate how well prices this perl is, she is definitely not a boat for you!” and refused to sell, despite the fact that the went up with his bid to even surpass the asked price! In other words: Axel really wants to sell to a person, who appreciates and will take care of his family member! Axel is a very good sailor and he’s the one who has taught me a lot about sail trimming. 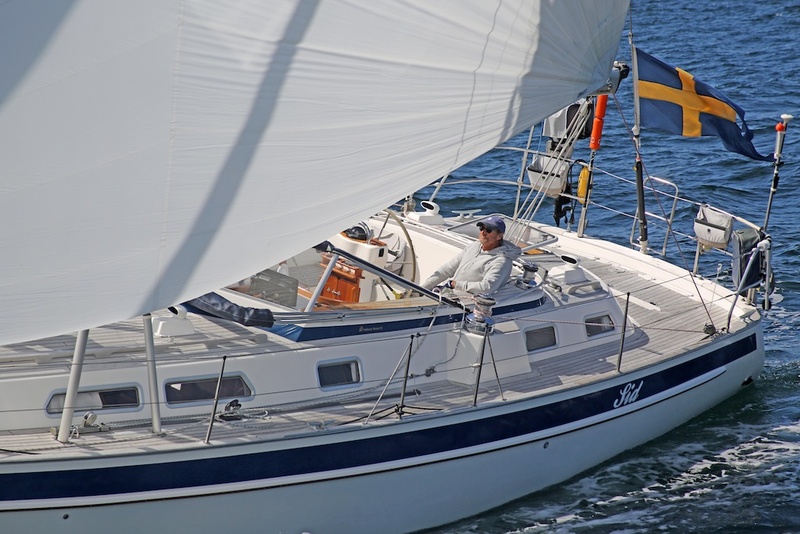 He has never sailed any regatta with his boat (for regatta sailing, he joins his son on his racer sailing round Gotland etc). 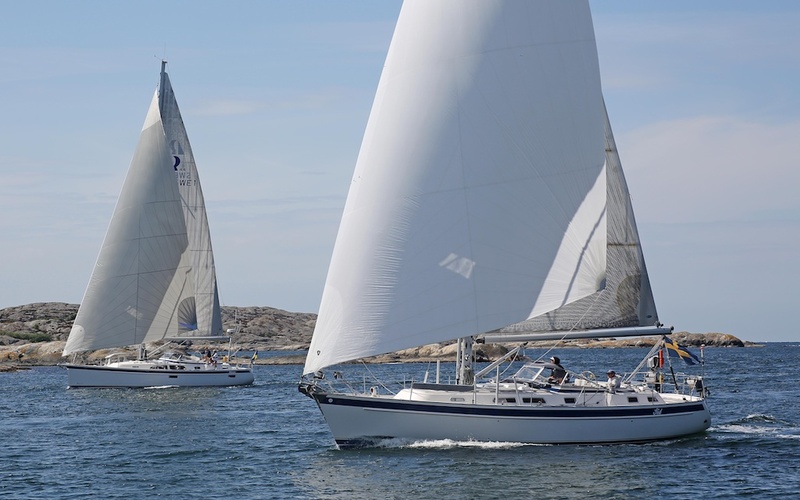 Nevertheless, Axel wants to be the fastest boat in the archipelago and therefore regularly buys new and very good sails. 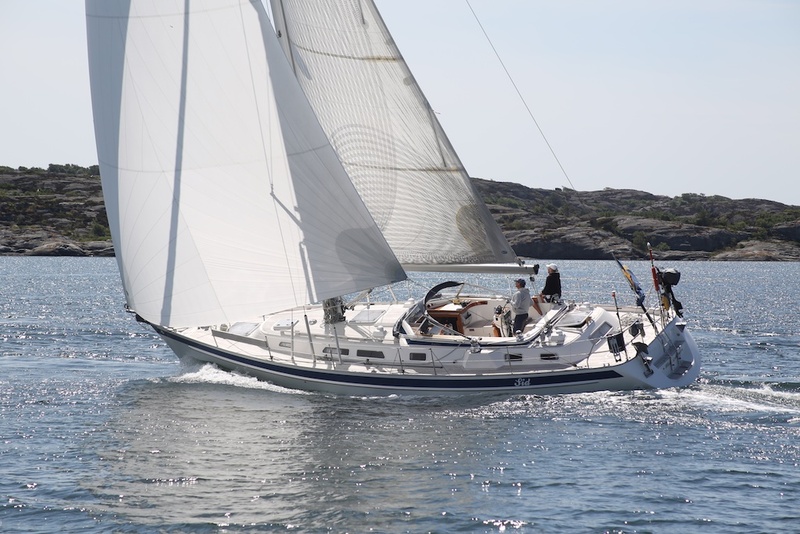 Sid sailing the Swedish archipelago with her new Code-0 sail in 2018. HR43 Sid (foreground) keeping well up with new brand new HR44 Miann (background). The HR43 Sid is a fast boat, for sure! Axel and Eva always enjoy overtaking other boats! Sid in Ellös with Regina Laska behind. Amongst other upgrades, he has bought an entire light package similar to Regina Laska’s, which I have described here. This HR43 is of the Mk1 model, which Axel personally prefers. 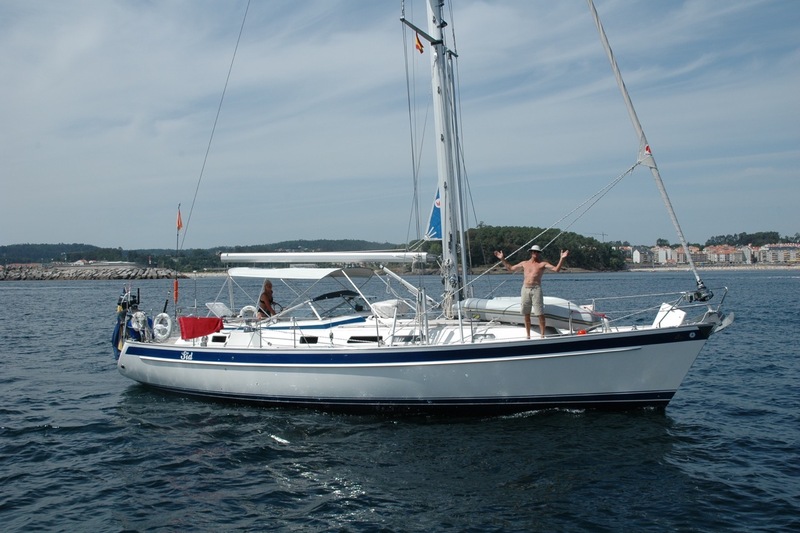 It has a more sturdy mast for serious blue-water sailing (actually the identical mast as the HR46 has). Therefore, the HR43 Mk1 does only need two spreaders. Also, it has the Volvo Penta D2-55 without the Turbo,which is a great advantage for slow-rev motoring or using the main engine as a generator running on low revs. Now, Sid doesn’t need that, since it has a diesel generator, but generally it is more practical to have a main engine without a turbo. I had the D2-55 on my HR40 and it was a great engine, maybe slightly overpowered. For the HR43, the D2-55 is just sufficient, although many other HR43s on the market have the D2-75, which is almost the same, but with a turbo. Besides, it is much more important to have a good propeller than many horse-powers and I myself “downgraded” from 100 hp to 75 on my HR46 and I am very happy with it. A diesel is much happier to go under some load than being run with too little load. The welcoming salon with the cozy and comfy easy-chairs. Please observe the lighting which makes it all so beautiful. The spacious fore peak is welcoming guests. 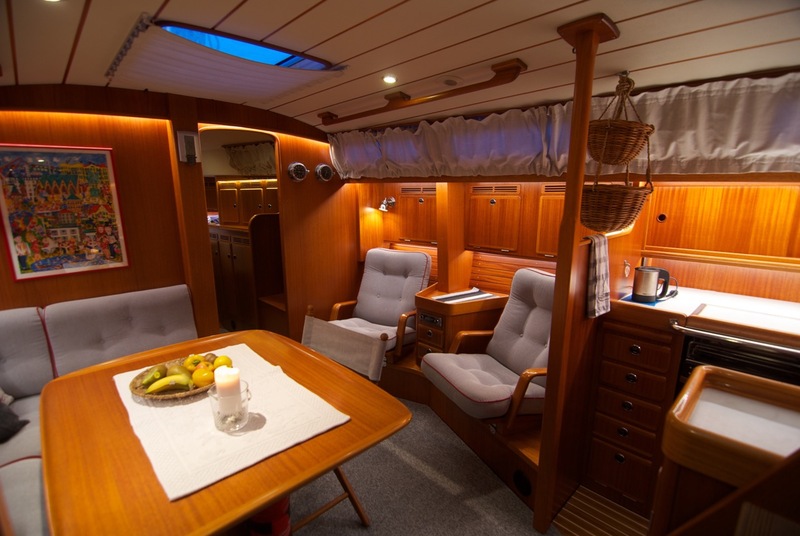 The aft cabin with its beautiful lighting. 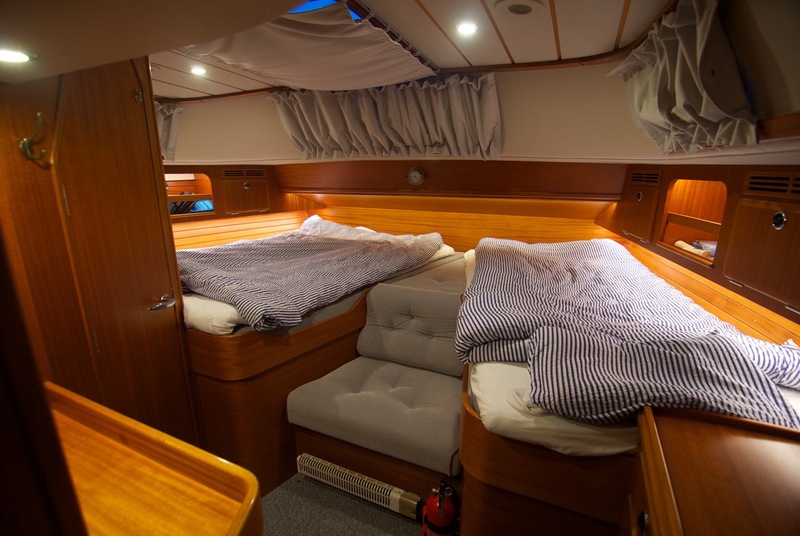 Double berth to starboard and single berth to port. 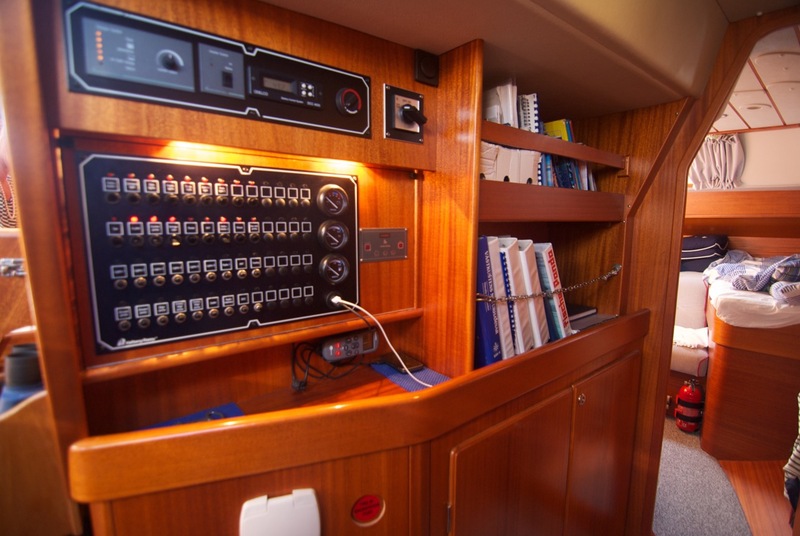 Further to the generator, it has electric heating in addition to the standard diesel-heater so you get a very pleasant constant heating when on shore-power. 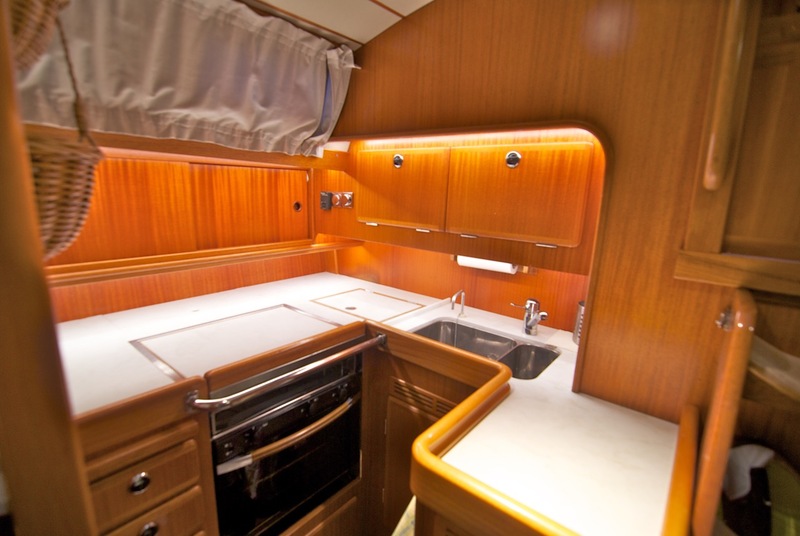 It has a washing machine, but lacks a water-maker, which could be added during a refit, if requested. Sid has removable davits and a stern anchor arrangement. The rig is manual furling, which could be converted to electric furling during a refit if requested. Genoa winches are electric. Asked price is just under 3 Mio SEK (let’s call it EUR 288.000), VAT paid for. If you are interested in this exceptionally fine and well-kept HR43, please send me an e-mail!